Watermelon is one of my all-time favorite fruits. It is very cleansing, alkalizing and mineralizing—excellent for flushing out the kidneys and bladder, healing and preventing a wide range of ailments. Watermelon is a member of the Cucurbitaceae family which comprises fruits like cantaloupe, pumpkin and similar plants that grow on vines on the ground. Watermelons can be round, oblong or spherical in shape; light to dark green in color, with lighter mottling stripes. Its succulent flesh is commonly bright red in color but there are also other varieties with dark brown, orange, yellow, pink and even white flesh. The water content in watermelon is extremely high at 92%. It is rich in beta-carotene, folate, vitamin C, vitamin B5 and smaller amounts of B1, B2, B3 and B6. This big fruit is a rich source of essential minerals like calcium, magnesium, phosphorus, potassium, sodium and smaller amounts of copper, iron and zinc. As in tomatoes, watermelon is loaded with lycopene, the red carotenoid pigment that gives the fruit its red color. This important antioxidant is powerful in neutralizing harmful free radicals in our body. Perhaps, one of the most important compounds in watermelon is citrulline. Read on to learn more about what citrulline can do for your body. Watermelon juice is very cleansing, alkalizing, diuretic and mineralizing. Watermelon is so rich in vitamins, minerals, enzymes and phytonutrients. The benefits of drinking watermelon juice is that it is easily digestible and the nutrients are quickly absorbed by your body at the cellular level. Drawing from the rich antioxidant and beta-carotene, the health benefits of watermelon are immense. The key to fighting and preventing diseases then, is to create an alkaline environment in your body. Due to its high water content, watermelon has a very alkaline pH, making it an excellent food for reversing symptoms of acidosis (over-acidity). Harmful pathogens—parasites, harmful bacteria, viruses, fungi and yeasts—thrive in an acidic body, whereas an alkaline environment neutralizes the toxic condition, preventing cell damage and aging. Watermelon has a 92% water content and is rich in electrolytes, making it an excellent rehydrating food. This is important, as dehydration causes the body to be acidic. Recent studies have discovered that watermelons have 1.4x the lycopene content of tomatoes when compared in the same volume. Lycopene is the phytonutrient in the fruit that gives it its red-pink color. And, in watermelon, this antioxidant is available in abundance. Unlike lycopene from tomato that needs to be processed for best bioavailability, the lycopene from watermelon is available directly to the human body immediately after consumption. What this means, is that no processing of the watermelon is necessary to enjoy the benefits of lycopene. Thanks to lycopene and other powerful nutrients in watermelon juice, they act as inhibitors for various inflammatory processes. Reducing inflammation provides relief and healing to individuals suffering from body and muscle aches, and various forms of arthritis. The presence of lycopene in high concentration in watermelons, plus its easy bioavailability, helps to reduce oxidative stress and inflammation in cases of asthma and allergies. Several studies reported lower rates of wheezing and allergic rhinitis in children who consumed antioxidant-rich foods such as watermelon. Oxidative stress resulting from excessive free radicals in the body, can have a harmful effect on the airway function, causing asthma and allergy attacks. In this case, consumption of watermelon juice helps raise the immune responses in preventing attacks. The arthritis.org website agrees that watermelon is beneficial for individuals suffering from various forms of arthritis. Studies show that watermelon can lower C-reactive Protein (CRP)—a measure of body-wide inflammation linked to arthritis flares and heart disease. Watermelon is rich in carotenoid beta-cryptoxanthin, which is beneficial for individuals suffering from rheumatoid arthritis, reducing painful inflammatory joint conditions. Among all fruits, watermelon has the highest amount of amino acid citrulline, a word derived from citrullus, a Latin word for watermelon. This compound is found in the highest concentration in the white rind (the white matter just under the skin). This is why it is beneficial to include the rind when juicing watermelon, especially if you have a kidney or bladder issue. High concentrations of citrulline and vitamin C (ascorbid acid) in watermelon rind juice help to break down kidney stones, clean out the kidneys and bladder, and reduce inflammation caused by free radicals. The citrulline in watermelon is also key in making this fruit richly hydrating and naturally diuretic. The natural diuretic effect ensures that your kidneys and bladder are effectively flushed of toxins, thus reducing fluid retention in the body. Ladies who have PMS issues with water retention may find relief when drinking watermelon juice a week prior to their menstruation, and also prevent bloating. At the first sign of an urinary tract infection (UTI), start drinking freshly-extracted watermelon juice—flesh, seeds, rind and all—till symptoms are gone. Like most fruits, watermelon juice has a natural laxative effect that helps improve regularity, for a healthy digestive system. Watermelon juice helps to calm the gastrointestinal tract, regulates pH levels, reduces inflammation and acidity. This makes it an excellent, healing drink for individuals suffering from acid reflux. Watermelon juice is one of the best juices to drink when one’s constipated. If you have chronic constipation, make it a point to drink a glass of watermelon juice daily to improve regularity. This is especially useful for children who are constipated—most kids love watermelon juice and it is easy to have them drink it. To relieve that occasional constipation, drink a big jumbo glass of watermelon juice (about 20-30 ounces) on empty stomach. Watermelon juice is rich in various minerals (calcium, magnesium, potassium, sodium and phosphorus) to replenish electrolytes lost after a good workout. If you have any of these symptoms, chances are that you have an electrolyte imbalance: muscle aches, spasms, twitches and weakness; restlessness, frequent headaches, insomnia, heart palpitations, fatigue, numbness and pain in joints, and dizziness. Drink watermelon juice consistently every day to supply your body with these rich minerals until your symptoms disappear. Watermelons contain high levels of beta-carotene (pro-vitamin A) that is converted into vitamin A (retinol) in your body when needed. If you’ve read that vitamin A is toxic at high levels, that is only referring to supplementary sources (synthetic) and doesn’t apply here. Dietary sources (natural foods) of vitamin A is non-toxic at all, even in high amounts. Beta-carotene is the red pigmentation that gives watermelon flesh its color. It is an antioxidant that protects your eyes from free radicals damage. One of the main causes of eye problems is due to low intake of antioxidants and vitamin A in one’s diet. So it makes sense that when you flood your system with watermelon juice (or other high-antioxidant juices) that is rich in these compounds, they help to nourish and improve your eye health. Vitamin A is essential for good vision, and it protects your eyes from various eye problems such as age-related macular degeneration, cataracts, retinal degeneration, night blindness and the like. The health benefits of watermelon is just endless. The combination of high antioxidants, lycopene and other essential vitamins and minerals in this fruit plays an important role in reducing the risks of heart attacks and strokes. Studies show that the rich nutrients in watermelon, along with lycopene are health-promoting agents that reduce risk of cardiovascular disorders. High consumption of lycopene in watermelon has been observed to reduce the thickness of the internal layer of blood vessels, thus reducing the risk of myocardial infarction. Risks of heart attacks, ischemic strokes and artheroslerosis are also much reduced when oxidation of LDL is prevented by drinking watermelon juice. The diuretic effect of watermelon juice flushes out toxins and excess salt out of your body. This process causes the walls of your blood vessels to relax and widen, thus improving blood flow and lowering blood pressure. This can be observed even after drinking just one glass of watermelon juice. Watermelon is one of the best fruits to be included when doing a juice cleanse. Alternatively, you can also do just a watermelon detox as it is effective for removing toxic wastes from your body that are slowing down your metabolism. When toxins are eliminated, it is only natural that your largest organ, your skin, will have a healthy glow. You may expect clearer, smoother skin that is properly hydrated. Individuals who suffer from itchiness on the skin as a result of acidosis toxicity, may also find relief after a watermelon juice detox. Watermelon is a valued source of natural antioxidants with special reference to its lycopene, ascorbic acid and citrulline. These compounds have been shown to act as protection against chronic health problems such as cancer. In fact, watermelon has the highest concentration of lycopene of any fresh fruit or vegetable. Lycopene has been extensively researched for its antioxidant and cancer-preventing properties. It is reported to be especially protective against cancers of the prostate, lung, colorectal, endometrial and breast. As discussed above, drinking watermelon juice relaxes and dilates your blood vessels and increases your overall energy and stamina. This works well for athletes as well as for men who needs that extra energy in bed! Watermelon acts as a natural viagra, according to an Italian study. Consuming watermelon juice that has high content of citrulline has been found to improve erection hardness in men suffering from mild erectile dysfunction. In the study, men with mild erectile dysfunction (erection hardness score of 3) received L-citrulline supplementation for a month. L-citrulline is the natural form of citrulline. 50% of the men were found to have an improvement in the erection hardness score from 3 (mild ED) to 4 (normal erectile function), with no adverse effects. Number of intercourses per month increased, and all participants reported being very satisfied with the treatment. Like all fruits and vegetables, watermelon is very low in calories. Consumption of 100 grams of watermelon provides about 30kcal. It contains almost 92% water and 7.55% of carbohydrates, out of which 6.2% are sugars and 0.4% dietary fiber. Eating watermelon or drinking of its juice is very satiating and fulfills your body’s need for all the nutrients that it needs. It makes you feel full for longer. And, because watermelon helps to keep your gastrointestinal tract healthy, prevents constipation, water retention and bloating, and removes toxins from the body—these all contribute to gradual weight loss. As your body becomes healthier, weight loss often comes naturally. Experimental studies have indicated that patients with high blood sugar levels (hyperglycemia) are more prone to risks of coronary complications. Elevated oxidative stress and LDL oxidation are major contributory factors. As discussed above, watermelon juice is excellent in countering both these conditions: oxidative stress and LDL oxidation. Lycopene in watermelon has the potential to reduce oxidized cholesterol in diabetic state. It has the ability to decrease body glucose and raise insulin level in type 2 diabetes. In a study, watermelon extract was administered to diabetic rats. At the end of the study, a rise in insulin level 37% whilst decline in glucose 33% were observed. 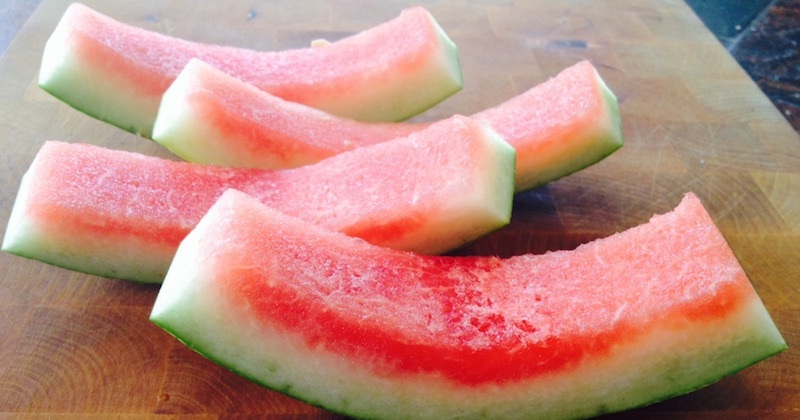 The study concluded that watermelon extract is a hyperinsulinemic and hypoglycemic product. So, can you have watermelon if you have diabetes? While watermelon extract may not be easily available (per study above), perhaps for individuals who have diabetes—opt for watermelons that are less ripe. This article tells you how to pick ripe watermelons, the opposites are true for picking unripe watermelons. The flesh of a less ripe watermelon will be lightly pinkish, not red, and will be low in sugar content. Wash the watermelon clean, include the watermelon rind and skin in your juicing to enjoy its full benefits of kidney cleansing. Eating a small amount of watermelon seeds can give you the chance to enjoy its many nutrients and benefits. Watermelon seeds are packed full of healthy fats. These fats can decrease your appetite, help you feel full, and strengthen your hair, skin, and nails. 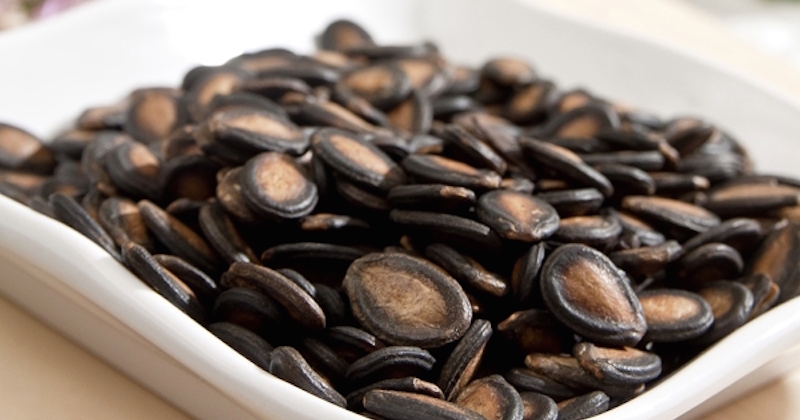 Another surprising nutrient you’ll find in watermelon seeds is iron. One ounce of watermelon seeds has 25% of the iron that a grown man needs every day. Hitting your recommended daily iron intake can prevent fatigue, improve mental functioning, and prevent anemia. Read more here, on how to eat watermelon seeds. So, the question is: Is eating too much watermelon bad for you? 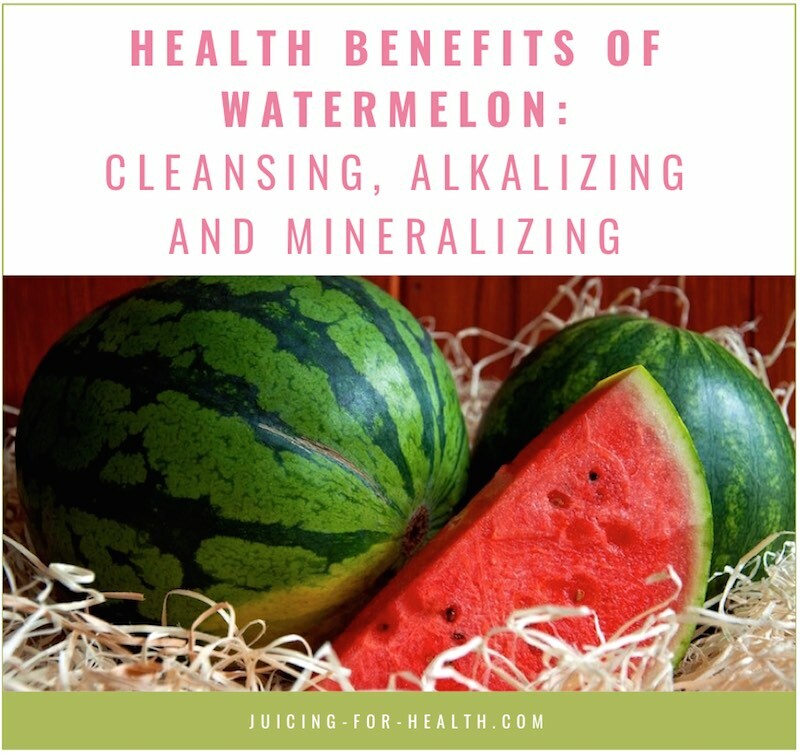 While watermelon is great and beneficial for all the health conditions we discussed above, eating too much of anything in the long term may have an adverse effect. It is fine though, to eat watermelon or drink its juice for a season, therapeutically, depending on the severity of your health condition. Here are some tips on preparing and consuming watermelon. The best time to eat watermelon or drink its juice is on an empty stomach earlier in the day. Drinking watermelon juice later in the night may cause you to want to pee when you sleep, thus disrupting your sleep. Watermelons grow on the ground so wash thoroughly before cutting to avoid contamination. If you cannot finish a whole watermelon wrap it up with a cling wrap and keep refrigerated to preserve its freshness and prevent it from drying out. This also prevents it from absorbing odors from other foods in the fridge. Watermelon can be eaten on its own, in fruit salads, or juiced. You may also freeze pureed watermelon in ice cube trays. Kids love this, especially on a hot day! You could try a watermelon and kiwi popsicle. Watermelon rind contains 95% of the nutritional benefits and can be juiced along with the seeds.